There are many ways to wire batteries to attain the kind of bank that you need to suit your needs. For instance, commonly RV's and Marine applications run off a 12v DC type of system. In order to build up your battery capacity, you will probably need more than one battery in order to attain the storage that you need. Also, you may run into space or cost issues with the larger 12v batteries. Often people will use two 6 Volt batteries wired in series to get to the 12 volts that they need. 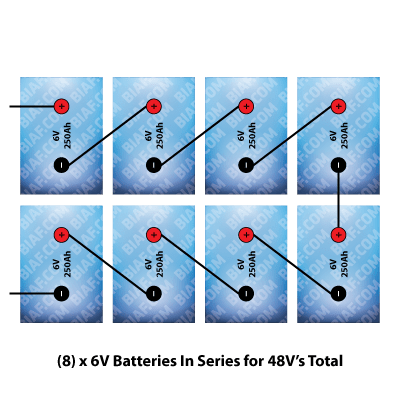 What Does Wiring Your Batteries in Series Mean? When you wire batteries together in series you will increase the voltage by the number of batteries in the group. This is done while keeping the amp hour capacity the same. For instance, below the two 6V 150Ah batteries pictured there, if wired in series will give you a total of 12V at 150Ah. You can see several other example of what a 12V, 24V, 36V and 48V battery bank in series looks like. The equations are simple for series configuration. There are two basics ones below. What Will My Total Voltage Be? The following wiring configuration requires two 6V batteries. 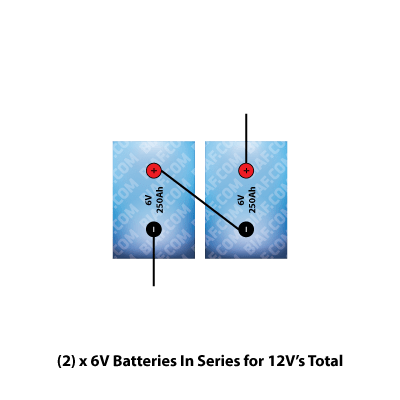 Using any two 6V batteries wired positive to negative will give you 12V on the furthest negative and positive post not wired to another battery. This is the point where you will connect your load. The following wiring configuration requires four 6V batteries. 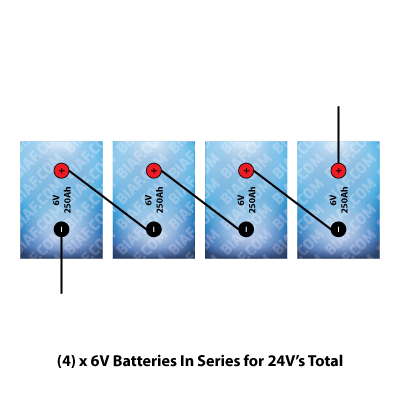 Using any four 6V batteries wired positive to negative will give you 24V on the furthest negative and positive post not wired to another battery. This is the point where you will connect your load. The following wiring configuration requires six 6V batteries. 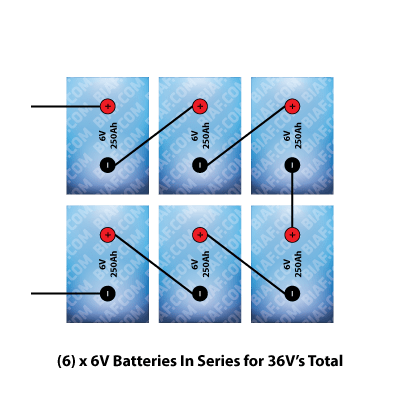 Using any six 6V batteries wired positive to negative will give you 36V on the furthest negative and positive post not wired to another battery. This is the point where you will connect your load. The following wiring configuration requires eight 6V batteries. Using any eight 6V batteries wired positive to negative will give you 48V on the furthest negative and positive post not wired to another battery. This is the point where you will connect your load.